Hawaii is one of my favorite places in the world, although i have not been that many places. I love the regional food and every time we visit this is one dish I look forward to eating so i wanted to try and make it myself. Sansei, in Maui, is where i was first introduced to this wonderful dish. I found this recipe online from a Hawaii Magazine blog by John Heckathorn. 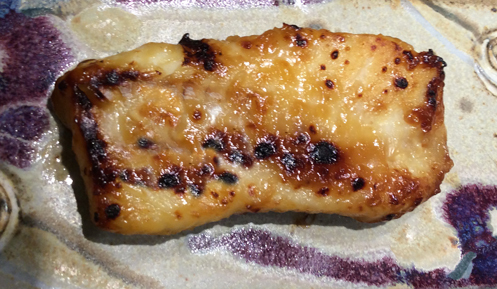 I have substituted regular Cod for Black Cod. Butter fish is a name for the preparation, not the type of fish. 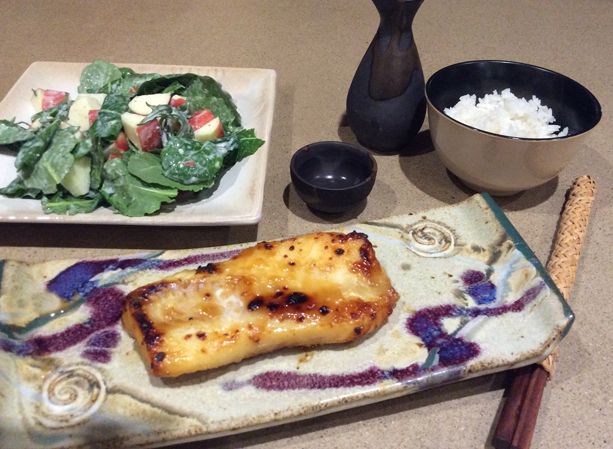 You can use the butterfish recipe on any other firm-fleshed fish, even salmon or ahi (tuna). It would be good on chicken (or even on tofu) as well. Combine ingredients over low heat in a sauce pan until caramel color. Cool the marinade and use it to cover the fish fillets. Refrigerate for at least 4 hours and up to 24 hours, then grill, broil or saute gently (I broiled). You don’t want to let the sugar in the marinade burn, just turn a beautiful golden brown. Serve with steamed white rice and a salad.